On September 7th, the major credit bureau Equifax announced that they had suffered a data breach which included personal information of 143 million Americans. To understand the scale of this, you might want to consider that the estimated number of households in the United States is less than 126 million. The data breached included social security numbers, birthdates, addresses, and, for some records, driver's license numbers and credit information. With this type of information, a criminal may well be able to apply for credit in your name. Equifax has responded to this breach by providing an informational website and offering credit monitoring - www.equifaxsecurity2017.com . At the site you can click on a "Potential Impact" button to get an answer from Equifax on the likelihood of your data being included in the breach. Even if your data is not included in the breach, you can enroll for a year of complimentary credit monitoring from Equifax by clicking on the "Enroll" button and then getting on their schedule for an enrollment date. Both of these functions will require you to enter your last name and last 6 numbers of your social security number - so be very sure you are on the correct site by checking the site name in your browser. If you enroll in Equifax's monitoring, be aware that you may be waiving rights to participate in a class action lawsuit on this breach later. Given that this breach will affect most persons in this country, it is very advisable to put some type of credit monitoring in place, even if you choose, understandably, not to do so through Equifax. You might also consider placing a credit freeze with each of the major credit bureaus; though this function will probably cost a small amount. There is a very nice write-up on credit freezes, including their benefits and inconveniences by Brian Krebs, a well-known security journalist, at http://krebsonsecurity.com/2015/06/how-i-learned-to-stop-worrying-and-embrace-the-security-freeze/ . It's also a good idea to periodically request your credit report to look for erroneous entries, which you can do at http://www.annualcreditreport.com/ . File your tax return at the earliest you can. There has been an increase in fraudulent filings in the past few years, and filing before the bad guys file a return in your name helps prevent tax return fraud. Sign up for your account with the Social Security Administration at www.ssa.gov. Reports of criminals signing up fraudulent accounts at the SSA have been increasing. Claiming your account before the criminals have a chance to do it is helpful. The government web site www.identitytheft.gov is also a good resource for learning to protect yourself. The DePaul Information Security team can be reached at email address security@depaul.edu. DePaul's Information Services sent out an email on Windows 10 availability this morning. "Beginning January 13th, Windows 10 with Office 2016 will be available as a supported choice for new computer orders. For information about ordering a new computer, please contact Procurement Services or visit their website. DePaul's default configuration will continue to be Windows 7 with Office 2013, as used in the classroom and lab environments. Please note that a self-service Windows 10 upgrade for your current computer is forthcoming, but not yet available. IS recommends that customers considering Windows 10 verify that the software and peripherals currently in use will be supported on this new platform, or that alternatives are planned for. Initial compatibility testing performed by IS has shown few issues. As community adoption grows and relevant issues are discovered, this information will be shared via the Windows 10 webpage. Information Services offers a variety of online and training resources to help faculty and staff learn about Windows 10 and Office 2016. Information about training resources and additional details about Windows 10 are available here." "Information Services is pleased to announce the launch of DePaul's Virtual Lab service, which offers convenient remote access to some of the software applications that were previously only available in DePaul's physical computer labs. You can access the Virtual Lab on- or off-campus from your personal computer running Windows or Mac OS. To log in, and for more information on how to open, save, print, and access files from within the Virtual Lab environment, please visit http://vlab.depaul.edu. 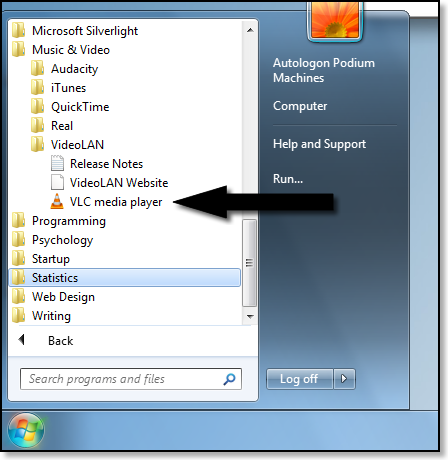 Initially, Maple 17, Minitab 17, R for Windows 3.1.1, SAS 9.4, and SPSS Statistics 21 are available in the Virtual Lab. Over time, Information Services will add more software applications to the Virtual Lab. Due to licensing constraints, we are unable to offer all physical computer lab software in the Virtual Lab. In particular, Microsoft Office and the Adobe Creative Cloud suite will be unavailable; however, enrolled students may obtain Microsoft Office 365 ProPlus for free and can purchase an Adobe Creative Cloud subscription for a small fee. Visit http://software.depaul.edu and choose "Software for Personal Computers" to get started." Under the Apple Self-Service Program, an upgraded level of Apple hardware support is now available to staff and faculty with DePaul-owned Apple computers that have a current AppleCare warranty agreement and run an OS X operating system. Information Services technicians are now able to provide onsite support for hardware issues that would have previously required an Apple store visit. At this particular time iOS devices are not supported. No special action is required on your part to utilize this program - any Apple hardware that meets the criteria above will automatically be covered. Dear Students, Faculty, and Staff,Information Services is pleased to announce several new software and service offerings which are now available to the DePaul community: Free MS Office for students, access to the Eduroam wireless network, unlimited access to Lynda.com, and software upgrades to Office 2013 and the Adobe Creative Cloud Software Suite. Microsoft has made the Microsoft Office productivity software available to students at no cost through their Office365 ProPlus offering. The software suite includes: Word, Excel, PowerPoint, Access, InfoPath, OneNote, Visio, Project, and Publisher. With Office365 ProPlus, DePaul students can install the most recent versions of Office applications on up to 5 PCs or Macs and on mobile devices. This new service offering will give you the option to have one experience across all of your devices and keep all your files in sync. Please visit http://offices.depaul.edu/is/services/Software/Pages/Office-365-ProPlus-for-Students.aspx for instructions on how to take advantage of this service. DePaul is also working with Microsoft on a program to provide a similar free option to all faculty and staff. We will send a follow-up notice in the next few weeks as we finalize the details with Microsoft. DePaul University has joined Eduroam, a consortium through Internet2 that facilitates access to wireless networks at educational institutions in the US and abroad. DePaul faculty, staff, and students can easily access the wireless network at participating schools across the world using their DePaul credentials. Using your CampusConnect Username with "@depaul.edu" appended to it and your CampusConnect password, you can connect to the "eduroam" wireless network at participating institutions without the need or hassle of a guest id while on the campus. The "eduroam" wireless network now exists across the DePaul campus as well to provide easy wireless access for guests visiting from other member institutions. For more information and instructions on setting up your client please visit http://offices.depaul.edu/is/services/wireless/setup/Pages/default.aspx. Office 2013 and the Adobe Creative Cloud software suite are now available in most university classrooms and labs. Macintosh computers in the classroom and lab environments will continue to use Office 2011 for Mac, but have received the same Adobe Creative Cloud software versions as the Windows computers. The Office 2013 suite will include the 2013 editions of Word, Excel, PowerPoint, Access, OneNote, Visio, Project, and Publisher and is now the default version installed on new university computers. You can read about new features and functions by visiting http://go.depaul.edu/office2013. The Adobe Creative Cloud software suite includes: Adobe Acrobat Pro, Photoshop, Illustrator, Premiere Pro, Dreamweaver, Audition, Fireworks, Illustrator, InDesign, Lightroom and several others. This upgrade brings continued enhancements to this collection of graphic design, video editing, web design and photography tools. For more information regarding the Adobe applications, please visit http://tv.adobe.com. 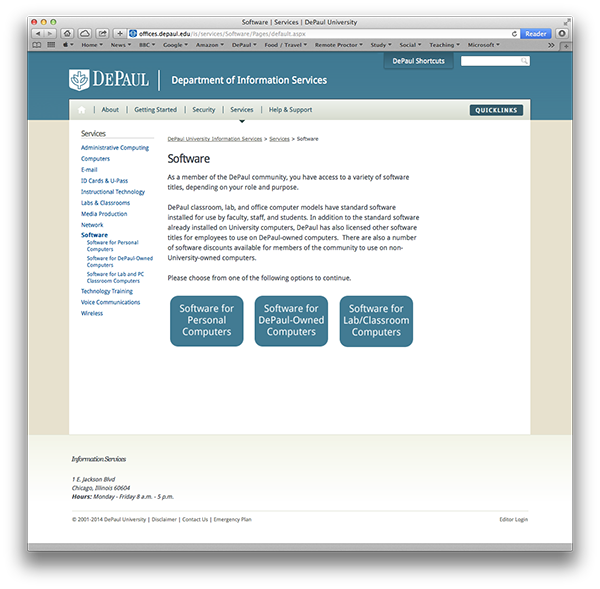 You can read more about available software at http://software.depaul.edu. Finally, Information Services is pleased to remind you that Lynda Campus is now available for all DePaul faculty, staff, and students. Lynda Campus provides unlimited access to a vast online library of instructional videos covering the latest software, creative, and business skills. Microsoft Office, Adobe Creative Suite, social media, web design, animation, photography, audio and video production, project management, and a wide range of other topics are covered. With Lynda Campus, you can watch full courses or small segments of courses at your own pace. To get started with Lynda Campus, please visit http://software.depaul.edu/training. If you have any questions, need help, or would like additional information on these software or service offerings, please feel free to contact the Technology Support Center at (312) 362-8765 or TSC@depaul.edu. Some good news for faculty and staff interested in the Windows Surface Pro - this is now a university supported option, and can be purchased via Procurement (Natalie Max would be the best contact). 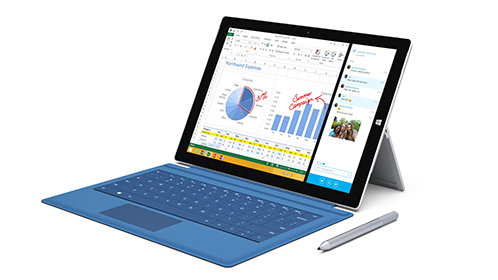 The Windows Surface Pro 3 has a larger screen than the previous 1 and 2, making it a much more usable device for teaching and presenting. This is a device that I think is worthy of consideration - the stylus allows faculty to annotate material on the screen (great with Open-Sankoré and screencasting). Thank you for all your assistance coordinating the removal of Windows XP computers from your department. We have finally come to the end of the road. As previously communicated, it is critical that all University workstations are moved off the Windows XP operating system by April 1, 2014. 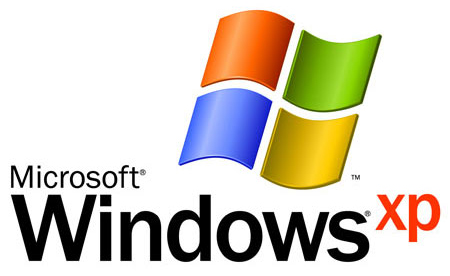 While we have been encouraging everyone to migrate any capable workstations to the Windows 7 operating system, and replace older computers that are not capable of running Windows 7, there seem to be some Windows XP workstations scattered about. This email describes how we will be disabling their use in order to protect the DePaul computing environment. On Tuesday, April 1st, Internet access will be restricted on remaining XP workstations and users will only be able to access the Windows 7 migration tool and the U & W network drives from these workstations. The desktop backgrounds will be updated to a bright yellow on April 1st to further notify users of these restrictions. To determine if a workstation or laptop is capable of running Windows 7, or to schedule an upgrade to Windows 7 on any of the 'capable' workstations above, please log into the specific Windows XP workstation in question as an administrative user, and visit http://offices.depaul.edu/is/services/computers/Pages/Windows-7-Migration-Registration.aspx (Note that you can also access this resource by going to the main IS web site (http://offices.depaul.edu/is) and clicking "Services"->"Computers"->Windows 7 (Under Operating System Support).) This tool will assist you in scheduling a memory upgrade (if needed), a Windows XP to Windows 7 migration (if capable), or identify that the workstation cannot be upgraded and will need to be retired or replaced. If you have any questions about this process, please contact the Technical Support Center at +1 (312) 362-8765. I received two separate faculty enquires about Tableau use at DePaul this week, so thought I would share information for other faculty interested in teaching with the software. Thank you to my colleagues in Information Services for providing additional information. As far as enterprise arrangements, there are report reader licenses and report writer licenses. Our Tableau enterprise report reader license for DePaul allows everyone working here to view Tableau reports that are published privately for DePaul. Report writer licenses can be had on a named user basis in the region of $1,500 each. Tableau public is a free version of the report writer license, but it comes with a couple caveats like limitations to the number of rows of data it will handle, and any reports you publish, and any data they contain become public domain and freely available on the Tableau website. Note: Internet Explorer 10 is not fully compatible with Campus Connect. You can try using Campus Connect in Compatibility View using the instructions below. If this does not work, please try a different browser. 1. From the "Safety" menu in the upper right, select "Delete Browsing History". 2. Uncheck the box "Preserve Favorites website data." Uncheck the boxes "Temporary Internet files," "Cookies," and "History." 5. Navigate to the Campus Connect login screen. 6. See if the Compatibility View button appears in the Address bar. The button will look like a ripped piece of paper. If the Compatibility View button is visible, click the button. 5. Repeat above steps again if unsuccessful. 2. Select "Clear Recent History". 3. Select "Everything" for "Time range to clear". 4. Select "Browsing & Download History", "Cookies", "Cache", "Active Logins". 7. Repeat above steps again if unsuccessful. 1. From the "Tools" menu, select "Clear Recent History". 2. From the "Time range to clear" drop-down menu, select "Everything". 3. Select "Browsing & Download History", "Cookies", "Cache", "Active Logins". 1. From the "Safari" menu, select "Reset Safari". 2. Make sure "Remove all website data" and "Close all Safari Windows" is checked. DePaul faculty will be pleased to know that the VLC media player is now installed on all classroom PCs again (thanks to Joshua Luttig from IS for the update). The VLC Media Player is a “free and open source cross-platform multimedia player and framework that plays most multimedia files as well as DVD, Audio CD, VCD, and various streaming protocols.” - In other words it plays pretty much any video file out there. Late last week Information Services adjusted the timeout duration for D2L due to security issues with D2L in classrooms. The new timeout duration for D2L is 30 minutes. After 30 minutes of inactivity a pop-up will prompt users to click “ok” to remain logged in to D2L. Inactivity in D2L is defined as not having clicked on a link inside D2L within 30 minutes. Users may need to enable pop-ups for D2L to see the warning in their specific browser. Students who are watching videos or reading materials may encounter this pop-up as they are passively watching rather than actively clicking.